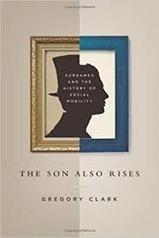 The Son also Rises by Gregory Clark is a book about social mobility, as traced through surnames. Clark prefaces his work by saying that what he is to say might be considered radical and controversial. Other studies of social mobility have find modest “inheritability” between generations. This study finds high levels of inheritability spanning hundreds of years. The theme for the early chapters is to find some source of high status individuals – be it graduation from prestigious universities such as Oxford, Cambridge or the American Ivy League, membership of professional bodies such as those for doctors or attorneys or from financial records such as occasional tax releases or records of wills (probate). Next a cohort of names is tracked through these systems and their level of incidence is compared against the background level of incidence for that surname. For example, “Smythe” is a relatively rare surname in the general UK population but it is found at a much higher level in records of registered doctors. The selected cohort of surnames may be from a distinctive ethnic population – i.e. Japanese in America, Native Americans or French settlers. Or it may be selected from a set of high status individuals at a point in time i.e. the Normans who came the England with William the Conqueror, or Swedish nobles. Clark’s discovery is that for all of these many cohorts across multiple measures of status the persistence over time is strong. The Smythes of 200 years ago had relatively high status then and they still do now. After nearly a 1000 years those with surnames associated with the Norman conquest are still a little over-represented in the intake of Oxford and Cambridge University. Similar behaviour is found for low status groups, Baldrick’s character through the several series of Blackadder is not far from the truth. In both cases these groups are “regressing towards the mean” but it is a long, slow process. Following these initial demonstrations of social mobility, Clark states his general law which is that the correlation of status over generations is high compared to previously measured parent-child measures and remarkably constant across multiple countries, periods in history and cohorts. The magic number for the correlation is 0.75. He argues that the reason that his estimate is higher than others is that he models social mobility with an underlying constant and a random fluctuation, the methods of calculation for early figures mean that this random fluctuation is much more apparent and brings down the measured social mobility. I don’t feel he demonstrates the origin of this discrepancy very clearly. Subsequent chapters go on to look at some cases where one really expects deviations from this general rule, in the Indian caste system where low mobility is expected and also in China, where post-revolution is expected to be a time of high social mobility. It turns out that in India, despite laws aimed at reducing caste based discrimination, social mobility is has not improved dramatically. In China social mobility seems to have been little bothered by the revolution. The odd groups that do break the rule of constant social mobility seem to do so by preferential recruitment i.e. in the past in Muslim countries non-Muslims were tolerated but charged a poll tax which meant that lower status/income people were more likely to convert to Islam leaving a more persistently high status non-Muslim population. A second route is by strong preference for “in group” marriage which is seen in the Indian Brahmin caste. It turns out that the surnames identified with British parliamentarians are particularly immobile. As for the origin of this constant social mobility, Clark ascribes it to what he calls “social competence”. There is a confused discussion of the balance of nature and nurture, not helped by a table where nature and nurture headings are accidently swapped (I think). I believe that technically it is all nurture, and Clark is trying to work out whether it is all about money. It strikes me that your wider family is where you learn about what the possibilities are for you and, while every family has it’s black sheep, the fact that your father, two out of three uncles went to Cambridge University means that your expectation is that you should aspire to that. Your family sets what is “normal”. I suspect that this is particularly the case for British parliamentarians where there seems to be a lot of siblings (Milibands, Johnsons, Eagles), husband wife (Cooper/Balls) and parent-child (Kinnock, Benn) combinations. Being a politician is an odd sort of job, there is not really a class at school for it, seeing your family working in the “family business” must be a big influence. “The Son also Rises” is an interesting read but turning it into a 300 page book seems to belabour the point somewhat. I liked the incidental details of the origins of surnames, and the various sources of information on social status. I got this as a Kindle edition, I wish I’d bought it as a paperback, there are numerous figures, tables and equations which didn’t render at a reasonable size in the first instance.